An adventure game with elements of life simulation in which we play Talma - an old woman leading a peaceful life in a deserted village. The protagonist performs routine tasks on her small farm. 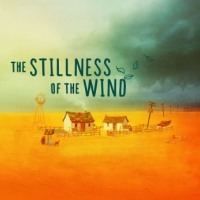 The Stillness of the Wind is an adventure game with elements of life simulation, developed by the independent studio Memory of God. The production is a commercial development of ideas initiated in Where The Goats Are - a free position being the developer's debut project. The Stillness of the Wind takes place in a village whose inhabitants gradually moved into the city until only the main character, the old Talma, remained in it. The protagonist is approaching the end of her days. The woman leads a lonely life diversified only by the visits of a traveling merchant; the man occasionally provides her with increasingly disturbing news from family and friends living in the city. In The Stillness of the Wind, the action is shown in isometric view. The gameplay has a relaxing, somewhat sleepy atmosphere, because it involves performing routine activities based on our own schedule. Talma must milk the goat and make cheese, take care of the hens and collect their eggs, grow plants in the garden and deter birds from it. The goods obtained in this way may be exchanged for goods brought by the above mentioned merchant, e.g. hay for goats, seeds, fairy tales or even ammunition for rifles. In addition, from time to time, the old woman can go for a short trip and visit the deserted area. Three-dimensional graphics of The Stillness of the Wind are maintained in original, slightly cartoon style and rich colors. The melancholic atmosphere is built by calm music.